Carl Sagan is one of my personal heroes. I named my youngest son, Asher Sagan Grey after him. To those who don't know the man, Mr. Sagan is a brilliant astrophysicist who was a strong advocate of scientific and critical thinking. By making science popular and significant to the common folk, he was able to inspire people to seek knowledge to explain the nature of the universe and to determine the purpose of humanity's existence. Here's my small tribute to the man. His most significant work for me is his book, Pale Blue Dot: A Vision of the Human Future in Space. The book was inspired by an actual photograph of the Earth taken by the Voyager 1 space probe back in 1990. 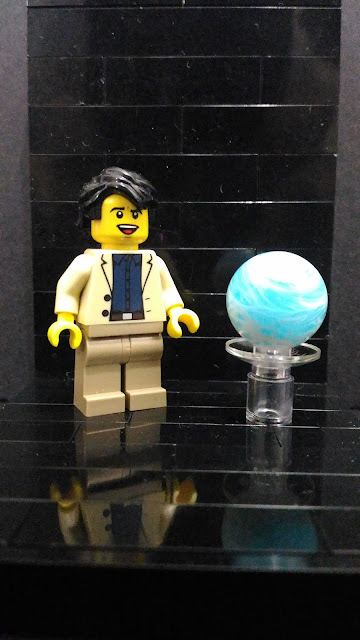 It was Carl who requested to have this picture taken right about the Voyager 1 would have a last glimpse of the Earth as it began its course towards the edge of the Solar System. 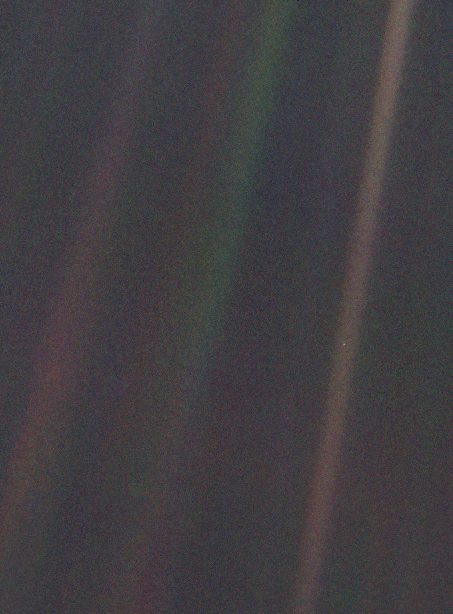 The photograph, as seen below, shows our planet as a small pixel illuminated by a the rightmost beam of light in the vast black canopy of outer space. I used to have an audio book copy of Pale Blue Dot. Listening to it was a truly humbling experience. In a way, Carl's reflections greatly influenced my perception of humanity's significance in the universe. The short but substantial excerpt from the book is something so haunting and profound. Maybe things will be different in this pale blue rock we're living on if each and every one of us have this wisdom in mind. "Look again at that dot. That's here. That's home. That's us. On it everyone you love, everyone you know, everyone you ever heard or, every human being who ever was, lived out their lives. The aggregate of our joy and suffering, thousands of confident religions, ideologies, and economic doctrines, every hunter and forager, every hero and coward, every creator and destroyer of civilization, every king and peasant, every young couple in love, every mother and father, hopeful child, inventor and explorer, every teacher of morals, every corrupt politician, every superstar, every supreme leader, every saint and sinner in the history of our species lived there-on a mote of dust suspended in a sunbeam. The Earth is a very small stage in a vast cosmic arena. Think of the endless cruelties visited by the inhabitants of one corner of this pixel on the scarcely distinguishable inhabitants of some other corner, how frequent their misunderstandings, how eager they are to kill one another, how fervent their hatreds. Think of the rivers of blood spilled by all those generals and emperors to be so that, in glory and triumph, they could become the momentary masters of a fraction of a dot.